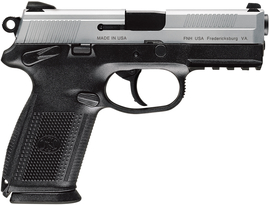 Ergonomic polymer frame has a low bore axis for less felt recoil and improved control. Grip panels are checkered and ribbed for comfortable, no-snag carry. Two interchangeable backstrap inserts quickly adapt to your hand size. Profiled stainless steel slide has cocking serrations front and rear. Four inch hammer-forged stainless steel barrel. Ambidextrous operating controls. Double action/single action. Made in the USA. Newly designed fixed three-dot combat sights with Deep-V rear notch.